After every renovation there’s always a certain part of the house that’s a little hard to leave behind. It was the backyard in the 4th flip, the great room in the 2nd flip, the master bathroom in the 8th flip . 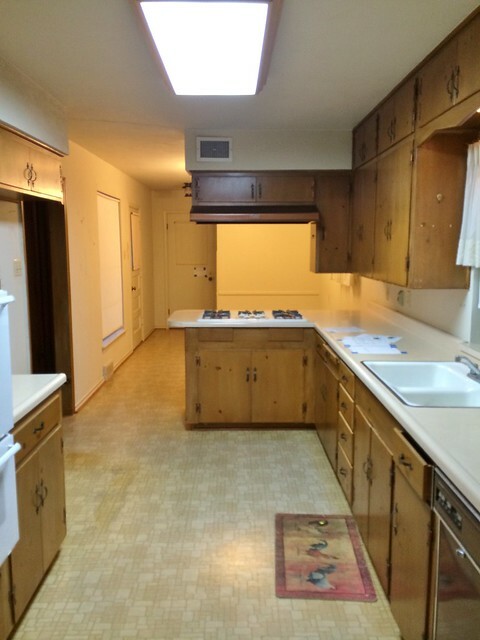 . . and then this kitchen in our 10th flip. 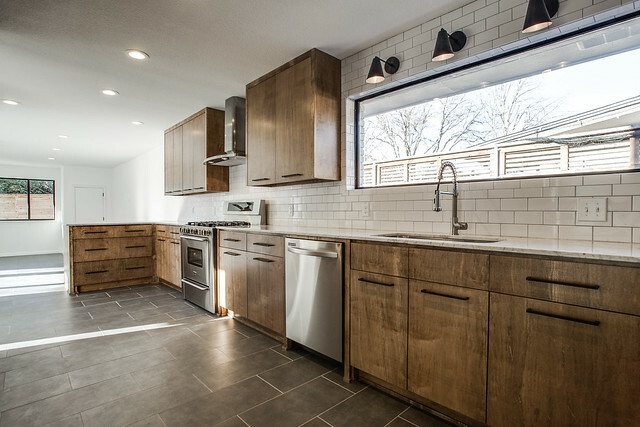 The goals for this kitchen were to brighten it up, modernize the whole space, and make it flow with the rest of the house. With some serious juggling, I think we accomplished all of that. In the end, we got rid of the powder room at the end of the kitchen, opened up the wall to the garage conversion (now the game room/family room) as I mentioned above, widened the opening between the kitchen and the formal living room, added a full bath near the front of the house in what used to be kitchen space, and added a laundry room and powder room right off the kitchen. Whew! Switching things around and opening up walls may sound like things that cost more money than they’re worth, but I think those changes were worth every penny. There’s not much use in prettying things up and changing finishes if the basic function of the space just doesn’t work. 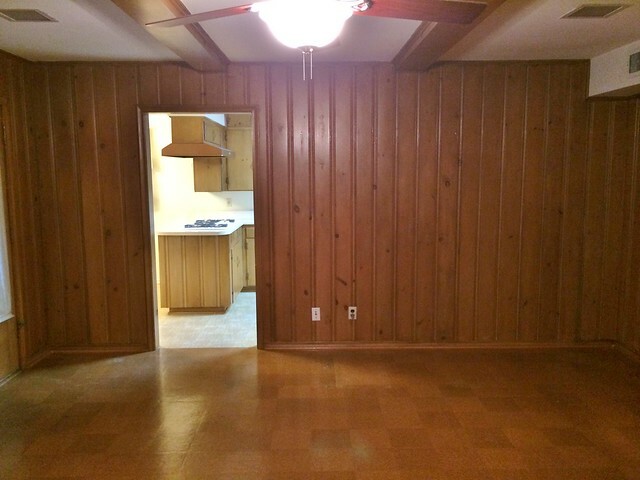 Removing the wall between the kitchen and the game room made all the difference in the world, both to the kitchen and the game room. I remember that Jason and I were driving somewhere in the car when all of a sudden a light bulb went off in my head – we absolutely had to remove that wall. I don’t know why it didn’t occur to me before! Seriously, we had looked at that space a dozen times before realizing the wall needed to come out. Anyhoo, the kitchen used to feel cramped and dark, but now it gets tons of light from the huge windows in the game room. And the game room used to feel exactly like what it was – a garage conversion. Now the two spaces feel open, and like they were always meant to be this way. So, once we decided to make all of those changes to the floor plan of the house, we had to figure out how to lay out the kitchen. 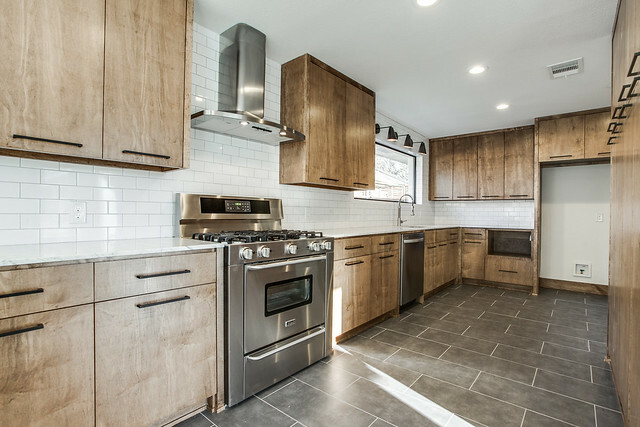 You might remember that I agonized (to put it mildly) over the floor plan of this kitchen, and you guys helped me figure everything out (more than once!). 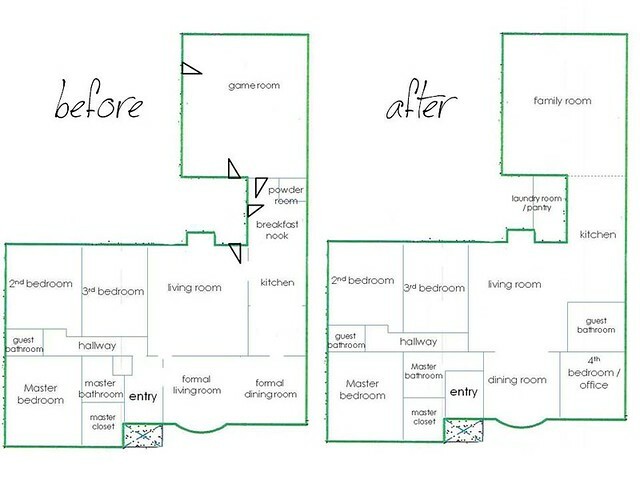 We decided to use the pantry/double oven/fridge space seen below for a full bathroom (accessed through a fourth bedroom/office at the front of the house), and open up the remainder of the wall so that the kitchen and formal living room feel more open to each other. We had to find new locations for all of those functions, which was a bit of a brainteaser, but the end result is worth it. 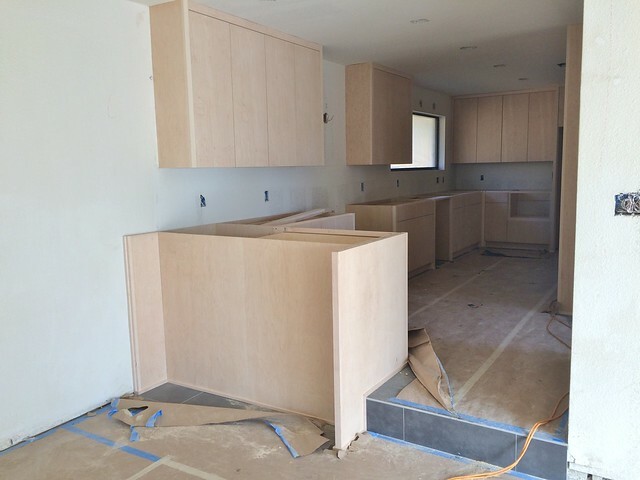 Here’s that view once the cabinets went in – remember, we scooted the kitchen towards the back of the house (and the game room) and turned what used to be the front of the kitchen into an extra bathroom. And here’s how that view looks today! This was our first time doing stained kitchen cabinets (although I guess we did do stained lowers here! ), and I hope I get a chance to do similar finishes in our next projects. I’m kind of in love. 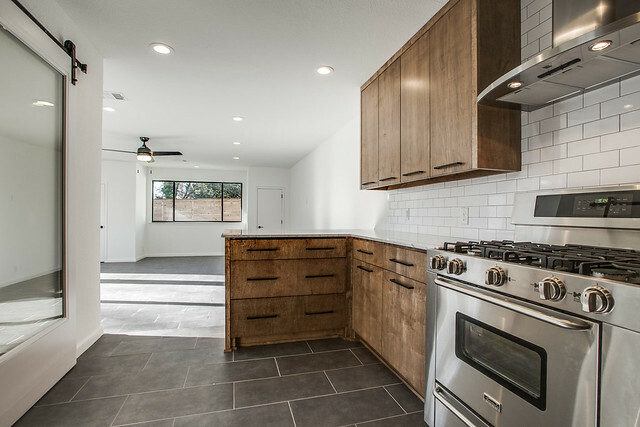 Did this kitchen turn out how you thought it would? Check out the rest of this renovation here. I just have no words for this gorgeousness. Hard to leave behind indeed! I love what you have done and want to just move in. 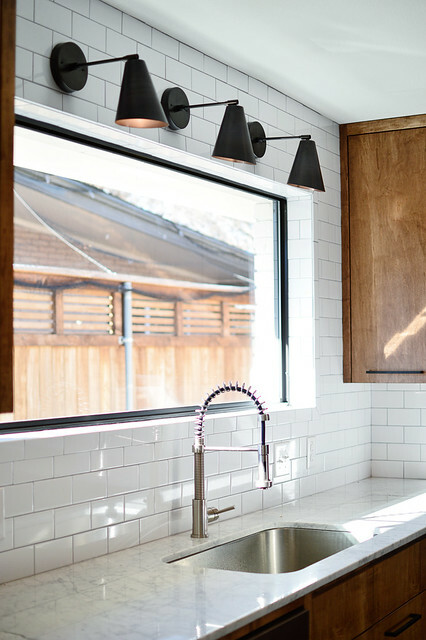 The huge window over the sink changes the whole room and those lights above it are killer. The cabinets are amazing. I completely want them – and I love the floor to ceiling ones. And the difference between the flow before versus now is unreal. I never would have dreamed that the garage conversion could feel so good and natural and un-garage-conversion-like. I always like what you do but this just floors me. Well done! Having seen the amazing finished result here, I truly can’t believe this was the original!! Such a huge difference. Beautiful work as always!! Very nice! I think this house is my favorite of your flips. Such a gorgeous kitchen! 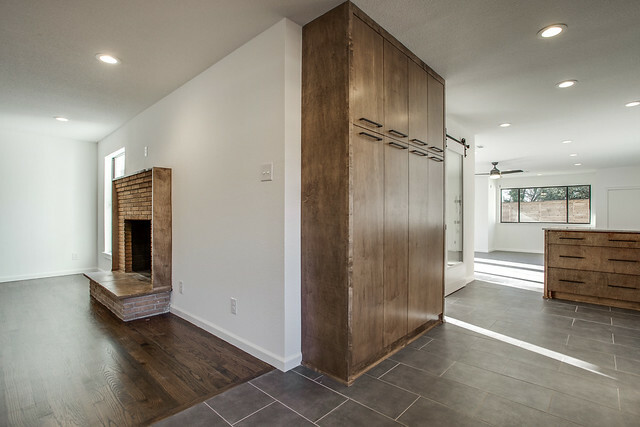 I’m so glad that you removed that wall…it ended up making such a difference in the flow and really opened up the home. 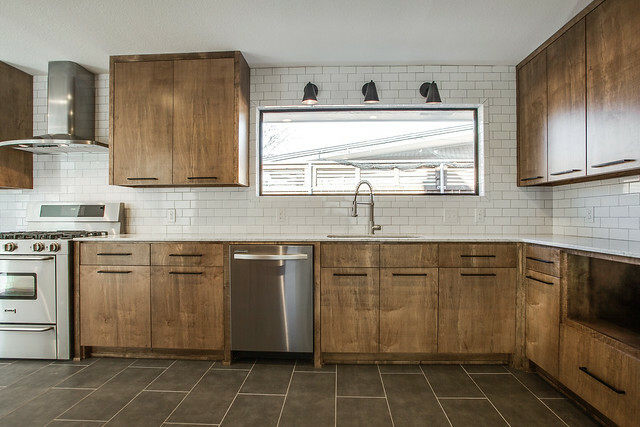 I love the stained cabinets and subway tile! Lovely! My husband have just about completed renovations on our tiny bungalow fixer. A ton or work but so worth it! I recently discovered your blog from Southern Hospitality and so need to sign up and follow your blog. I’ve searched around here and get inspiration from nearly every page I view. I know I’m missing it but can you tell me where on your home page I go to to sign up to receive blog update via email? Thank you for inspiring me again. LOVE the layout, hate the cabinet finish. :( I can’t get the impression out of my head that the stain looks uneven and streaky. This would be a major turnoff to me in buying this home. I’m sure the right buyer will come through and love it though! It is fun to see some of the more risky elements in this home. And really, amazing job with the layout changes in this whole house! Wow! It looks amazing and I am loving the open layout. It makes the house look so much larger. Thank you for sharing! What a transformation! I love how you scooted the kitchen and were able to add a larger guest bath than what was there before. The bigger window is going to add in so much natural light too. 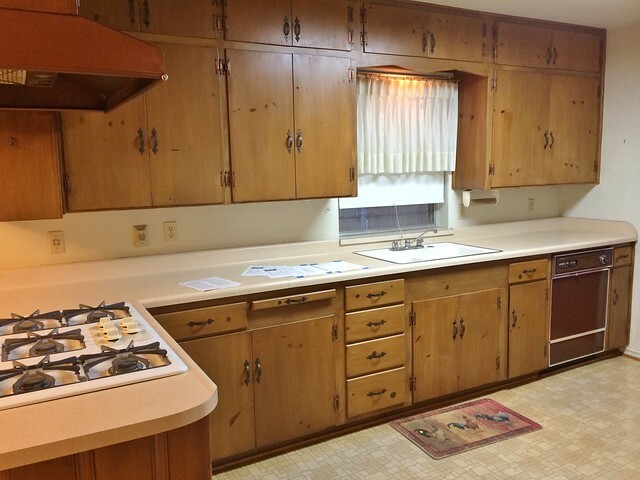 what color did you use to stain the cabinets? They look beautiful! Thanks, Sarah! They’re Minwax Special Walnut. Hope that helps! Wow! The difference in the style and elegance. Clap Clap. What a luxurious and beautiful kitchen. 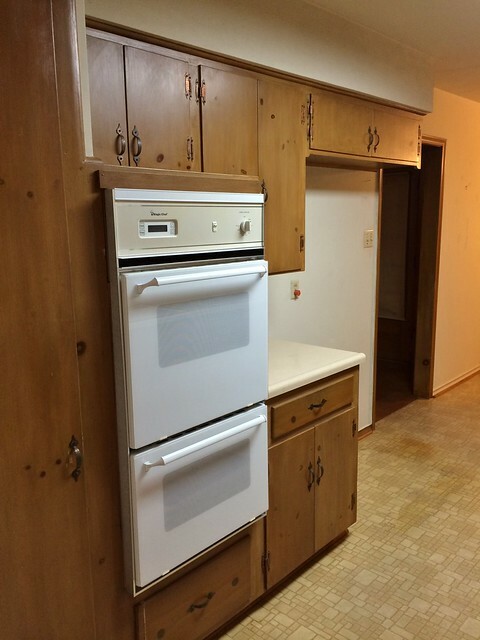 I really like the cabinets with the updated stainless steel appliances. I would have a hard time leaving this kitchen as well. It is fantastic!!! It looks so expensive.